I’ve been reading a lot about the LA river recently because of the announcement that Frank Gehry is working with the City of Los Angeles on plans to revitalize the river (plans that some say may clash with previous plans to renaturalize part of it.) 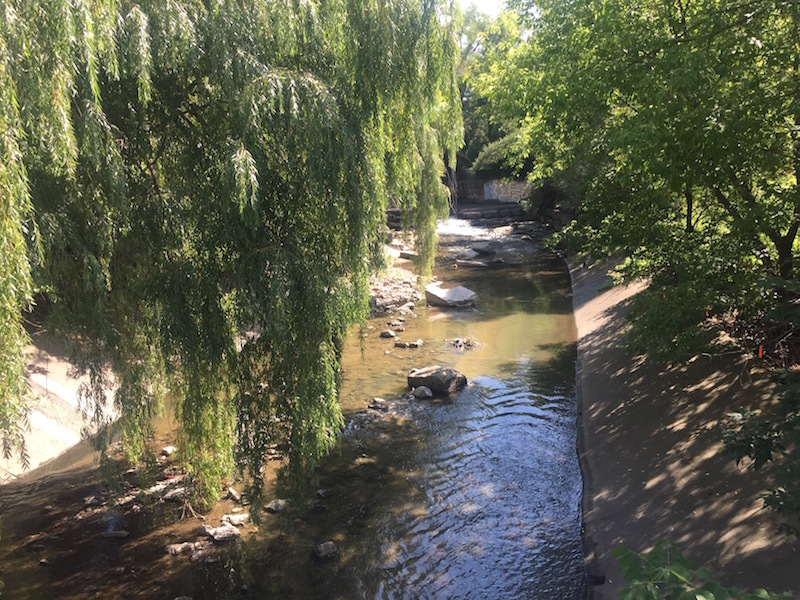 So I decided to check out one of Toronto’s own mini-LA rivers, Black Creek. My first glimpse of Black Creek was before I knew it was Black Creek. I saw it as I passed by on the new UP Express on my way to Newfoundland for a friend’s wedding last month. There, outside the window of the train, I saw a large concrete channel marching down the centre of a street, a trickle of water down its middle. What is that, I thought. It looked so un-Toronto to me. 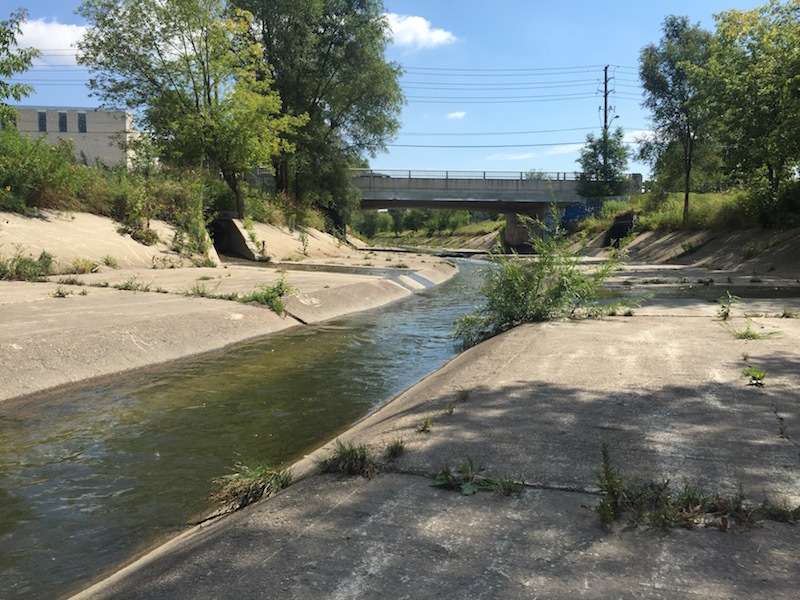 Turns out it’s part of Black Creek, one of Toronto’s most polluted waterways and the smallest subwatershed of the Humber River, into which it flows. 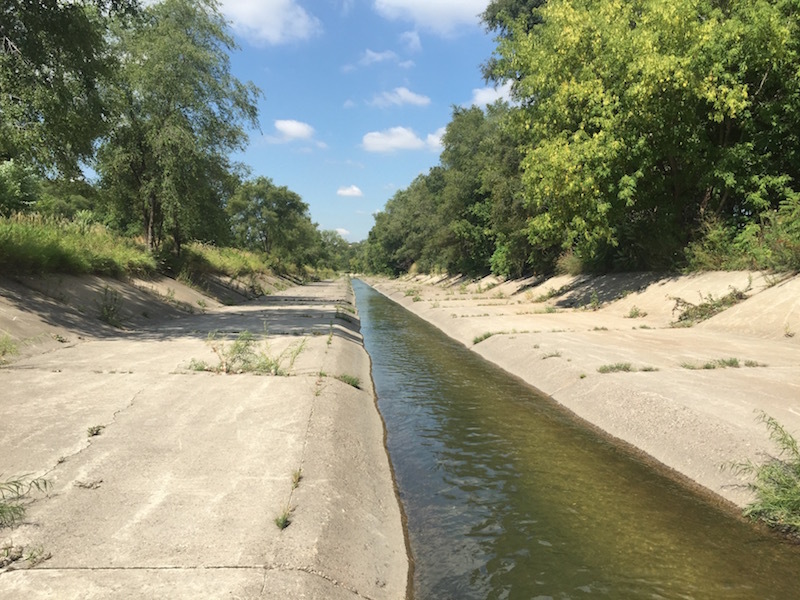 According to this little history on the Black Creek Conservation Project website, Black Creek was channelized following Hurricane Hazel in 1954 as a way to prevent flooding and whisk stormwater away faster. It was apparently fully surrounded in its open concrete channel by 1965. The effect is pretty dramatic. It’s horrific and beautiful at the same time, in the way that weird, concrete urban things often are where nature has started to reinsert itself in all the little nooks and crannies. Not all of the creek is this austere, however. 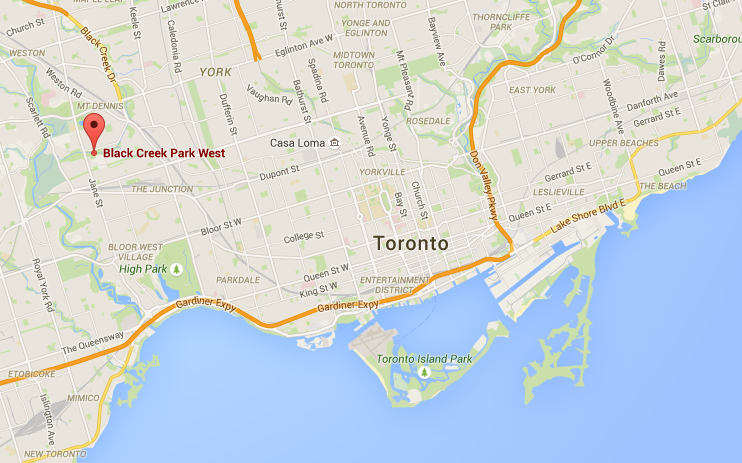 What makes Black Creek so interesting is how its concrete channel passes through different landscapes. 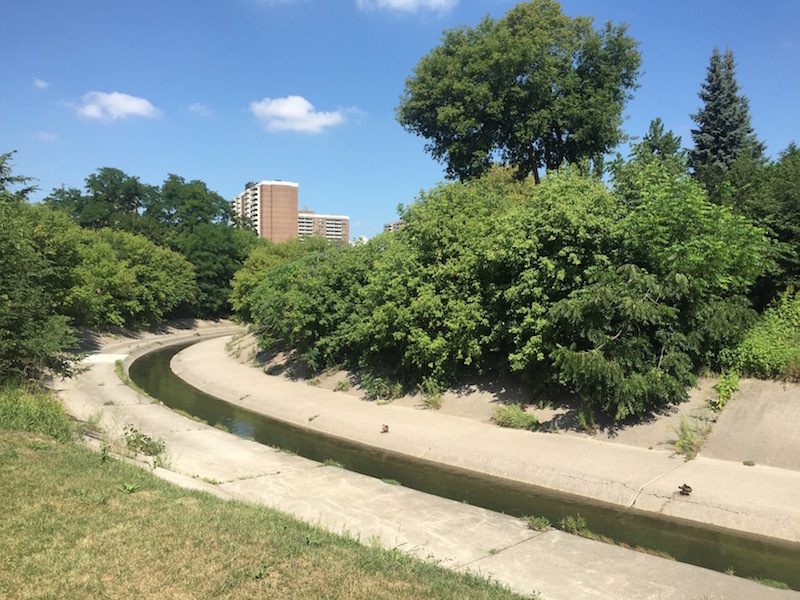 Following the section where it slices down the centre of a road, the creek passes through a series of parkland before it runs through a golf course and then meets up with the Humber River. Here the creek’s concrete channel winds its way through mowed grass, willow trees with their boughs hanging low over the water, and alongside tennis courts, children’s playgrounds, and ponds with green water so still that their surfaces appear solid. In some places rocks have been placed in the channel to break up the water, creating more of a natural look. Geese hang around on the concrete like bored teenagers. While signs warn people about the potential dangers of flooding during rainstorms, there is no fence to keep you from going down into the channel. The banks are sloped gently and the base of the channel is flat and wide on either side of a trench cut down further where the water flows past. It’s almost like two sidewalks. 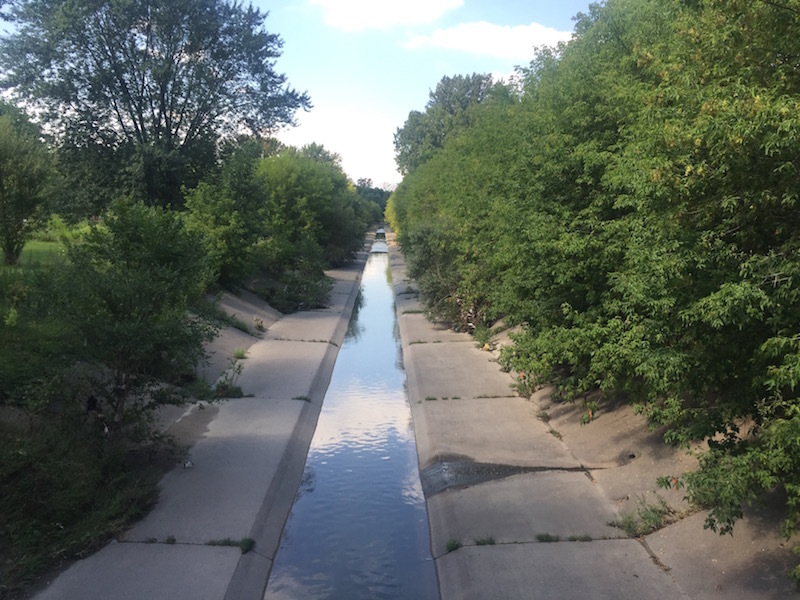 There are other creeks in Toronto that have been corralled into concrete channels like this one. Shawn Micallef has written about two others, Lavender Creek and Mimico Creek, both of which have been at least partly channelized. All environmental concerns aside, I can kind of see his point. Concrete is ugly and brutish, but that’s kind of its appeal, especially in contrast to the soft, green of the parkland around it. There is something weirdly lovely in an almost dystopian sense about seeing Black Creek wind its way through the city in its concrete chute on its way to the Humber. ← What’s in a (park) name? Great article Jake. Truly loved reading about the park/river form another perspective as well as the thoughts and research you added. I’m a huge urban enthusiast and after wandering it a few months ago I created a proposal to reclaim the path for the NXT competition. It was the variety of landscapes that I really thought was exciting. The concrete channel was an adventure with curves, both built and natural barriers and paths, and of course a changing waterscape. I think I agree with Gehry about the architectural feature of concrete. My partner on the project wanted to remove it all for the proposal however I liked retaining the entire material ecology. Check out the proposal video here if you’re interested. This is so great! Thanks for sharing this. It really is an incredible space that has a lot of potential. Good luck with the competition. Thanks Jake. We are excited to be shortlisted. Are you going to be at the NXT City Night? Would love to talk to you more about your City In A Park work.